When I started running, I didn’t spend much on headphones. I’ve always just used Yurbuds wired headphones and just dealt with the cord getting in my way. But once I got a Flipbelt and started wearing my phone around my waist versus on my arm, I looked into getting a pair of Bluetooth headphones. The ones I ordered were Jabra Sport Pace Bluetooth Earbuds. That was back in April 2016 and I’m still using the same pair of headphones over two years later. They’ve been through two marathon training cycles and are going strong, no signs of the battery life getting worse at all. And it’s not like I baby these headphones, they are my go-to headphones for 99% of my workouts. The only time I wear wired headphones while working out is for my winter runs when it’s super cold (because I’m not sure how well they would hold up when it’s that cold and they aren’t as comfortable as my wired headphones under a hat. But, for all my other workouts, they are what I wear. This means I’ve used them in all different weather conditions. As long as it’s above freezing, I’m wearing them. This means they’ve made it through super sweaty summer runs (including marathon training long runs), cooler weather and lots of rain. It rained for about half of the Twin Cities Marathon (so about 2-2.5 hours) and they are still going strong. And the battery life is pretty good on them if you aren’t using them for longer than 4.5 hours at a time. I charge my headphones twice a week right now (but I also don’t let them completely die on me). During both of my marathons, they died right around mile 22 but i also had them going for a little bit before the start of the race to get me in the right mindset. The charging time is quick on them (they full charge in less than two hours) and if you forget to charge them before a shorter workout, you can get about an hour worth of use on only a ten minute charge. Overall, I think the Jabra Sport Pace Bluetooth Earbuds are an awesome choice if you won’t be using them for super long runs on a regular basis (or are fine without music for part of a long run). They make it through all sorts of weather conditions and I don’t feel them at any part of my run. Keeping my bag organized and not just throwing everything in there means I can easily grab out what I need for my run or workout without wasting time digging around and dumping out the entire bag. Keeping everything in pockets also means that the main compartment is free for my to throw in my workout clothes or foam rollers without breaking anything or worrying about misplacing an item. Overall, it’s a less stressful experience getting to the gym and getting a workout in since I put a system in place for my go-to items. How do you keep your gym bag organized? Let me know in the comments! Since it is Valentine's Day, I figured not to do a running rant like I had originally put on the calendar. Seriously, a running rant on Valentine's Day? I was not thinking when putting together the calendar. So instead of me pouring my heart about something that’s bothering my on my runs (which is coming up! ), here are some of my running loves. Lemon Sublime, not doubt. While I love my sweets (and the Chocolate Outrage is just like eating frosting) my go-to Gus are always the fruity flavors. And I love the sour taste of Lemon Sublime, perfectly tangy on the run. Well, since Vinnie is no longer able to run, I’d have to say Mike (even though he’s usually on the bike and not running). It’s just nice to be doing something together that’s not dinner or a movie plus he’s so supportive of my running. And he hasn't tried to run after any squirrels like Vinnie did on our runs. My Jabra Sport Bluetooth Headphones. I do not like running without music, an audiobook or podcast. I just need that distraction and time to myself. So I love my Jabra headphones because they are small and compact and last for hours, plus no cords for me to get tangled up in! Pigeon pose. It’s a difficult pose for me to hold but it’s awesome post-run for stretching out my hips. Plus it’s a reminder of how flexible I’ve gotten since it was such a difficult pose for me to get into at first. My Twin Cities Marathon medal. Mostly because it was my first marathon and the most serious training I’d had up to that point. But it’s also a super unique design that incorporates both the distance and the Twin Cities in Motion leaf. And it’s super heavy. If someone broke into the apartment, I could do some serious damage with that medal. Well, it’s not as much as anything Hamilton related. They are just fun and have an awesome beat. Plus we are seeing it on September 1! So if you running in the Twin CIties and pass someone singing Hamilton songs, it’s probably me. I’m sorry that you had to hear as I can’t carry a tune in a bucket. 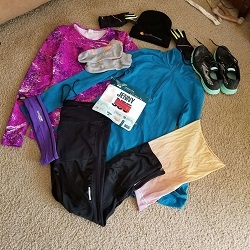 What are some of your running loves? Let me know in the comments!